The cost of employee turnover is a topic discussed often, but rarely acted upon, mostly because it’s often difficult to evaluate in a concretely compared to something like extra revenue. However, in an age where technology continues to make the people in a business more important, the issue of retention and turnover should play a primary role in the mind of executives and managers alike. In this post, we’ll examine some of the work that has already been done on the cost of employee retention, give you a spreadsheet that can be used to calculate the true cost at your own company, and then suggest some ways for improving retention, including the role that optimization can play. Employee turnover is known to managers and executives alike to be a painful experience. All have experienced how difficult it is when an amazing employee leaves, when someone popular in the office departs, or even just the stress felt in a team having to pick up the work of someone who exits unexpectedly. But rarely do many companies take concrete steps to reduce their employee turnover. The first step towards convincing management to act on employee retention is to give them a concrete benefit in terms of dollars in doing so. There has been lots of work done on figuring out the true cost of employee turnover, and the results have varied widely. One thing, however, is for certain: it’s expensive. The Center for American Progress (CAP) published a report that estimate the cost of replacement for highly-skilled employees at 213% their annual salary, while the cost estimates for jobs earning $30-$75K was around 20% annual salary. These estimates, however, seems to be on the low end, with others like Josh Bersin suggesting the true cost lies somewhere between tens of thousands of dollars to 1.5-2.0X annual salary. He explains the costs of losing employees, including cost of hiring a replacement, cost of onboarding, lost productivity, lost engagement, and more. Perhaps more importantly, he also makes the point that employees are appreciating assets - they get more productive the longer they are at a company, learning the systems, products, and how to work together with their team. His visual above shows the progression an employee makes from being a “cost” to an organization to becoming extremely valuable. 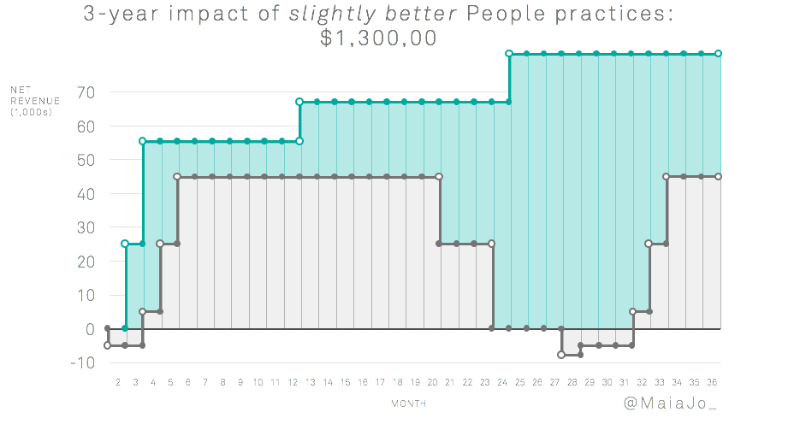 In her case study, using a salesperson that earns $50K/yr (and generates $50K/mo in revenue), she argues that better “People Practices”, which include better onboarding and management, yields a difference of $1.3M in net value to the company over a three year period. No matter how you prefer to examine the cost of employee turnover, the result is clearly high. So how do you calculate the true cost at your company? Overall, the cost of employee turnover is the equal to the number of employee departures times the average cost of these departures, which is fairly intuitive. Your turnover rate is the number of departures divided by your total number of employees. But how do you get to the average cost of employee departure? There are a couple options. This analysis is okay, though it can sometimes be tough to come up with good numbers unless we go into a little more detail. This in-depth list comes mainly from an article by William Bliss, and gives a much more concrete list of variables for you to examine to establish the cost of someone leaving your company. We’ve summarized the list here, and provided both the basic and advanced methods of analysis in a spreadsheet for you to use here. Estimate the cost of the person(s) who fills in while the position is vacant, using overtime rates for temporary employee or existing employees filling in. Calculate cost the cost of lost productivity at minimum of 50% of the person’s compensation for each week position is being covered, or 100% if position completely vacant. Compute the cost of exit interview to include time of person conducting interview; time of the person leaving; administrative expenses of stopping payroll & benefits, and time spent on forms to process resigning employee. Estimate cost of manager understanding work to be covered, and their version of exit interview. Add up the cost of training company has invested in employee, including licenses, certifications, internal and external training. Determine impact on departmental productivity because person is leaving. Calculate cost of severance and benefits provided to those leaving. Add up cost of lost knowledge, skills and contacts the leaving employee is taking - use 50% of annual salary for one year service, and add 10% for each year employed by 10%. Estimate cost of losing customers that employee is taking with them, or amount it will cost to retain customers of the salesperson or customer service rep who leaves. Subtract cost of departing person for the amount of time position is vacant. Cost of advertisements, employee referral costs, recruitment agency costs at 20-30% annual compensation, internet advertising costs, etc. Add cost of internal recruiter/HR person’s time to develop sourcing strategy, review backgrounds, prepare and conduct interviews, conduct reference checks, etc. - usually ranges 30-100 hours per position. Cost of other recruitment personnel (like recruiter’s assistant) in supporting this process (arranging interviews, travel arrangements, etc.). Determine cost of hiring (immediate supervisor, manager, peers, selection committee), including time to review and explain position requirements, review background, conduct interviews, select finalist. Also include their time to do their own sourcing of candidates from networks, contacts, other referrals (often upwards 100 hours total). Add up administrative cost of handling, processing, and responding to average number of resumes per opening at $1.50/resume. Estimate cost of drug screens, educational and criminal background checks, and other reference checks, especially if these are outsourced. Consider cost of various pre-employment tests, or other tools used to test skills, abilities, aptitude, etc. Cost of orientation and cost of the person conducting orientation, as well as materials. Cost of departmental training as actual development and delivery cost as well as cost of salary of the new employee. Add cost of person conducting the training and costs of the materials needed for training (manuals, computer, etc.). Cost of supervisory time spent assigning, explaining and reviewing work assignments and output (lost productivity of supervisor). Minimum seven hours per week for at least 8 weeks. Add 75% of employee salary for 2-4 weeks as they operate at 25% productivity. Add 50% full salary for weeks 5-12. Add 25% full salary for weeks 13-20. Calculate cost of coworkers and supervisory lost productivity due to their time spent on bringing new employee “up to speed”. Figure the cost of mistakes new employee makes during this period (first 20 weeks). Estimate cost of lost department productivity if departing person is manager. Calculate impact cost on completion or delivery of critical project where departing employee is important. Add cost of reduced productivity of manager or director who loses a key staff member (like assistant). Calculate cost of bringing new person onboard, including putting person on payroll, computer passwords and identification, business cards, etc. Add expense of manager’s time reviewing new employee’s work. For sales staff, divide the budgeted revenue per employee into daily amounts and multiply that by days position is vacant, including training time. Also add lost productivity percentages above to calculate lost sales until sales rep is fully productive. For non-sales staff, calculate the revenue per employee by dividing total company revenue by average number of employees in given year, and then estimate lost revenue by multiplying number of weeks the position is vacant by average weekly revenue per employee. For your own use, we’ve created a spreadsheet that makes adding up all these costs easier. Please share your results with us if you use it! As you can see, the list is long; it’s easy for costs to add up quickly. The next question is how do we minimize or reduce this cost? There are two main aspects to reducing the cost of employee turnover for your business: reducing the turnover itself, and reducing the cost of the turnover when it happens. The principles involve minimizing the time where a new employee is a “cost” - onboarding and hiring - and maximizing the potential of the employee through good management. “Onboarding: A good onboarding program accomplishes two goals: 1) It decreases the time it takes an employee to become a fully contributing member, and 2) It significantly increases the likelihood that the employee will stay with the company long-term. Hiring: An excellent hire has a higher maximum output from the beginning, plus has the added network effect of attracting and elevating other top performers. Management & Development: Excellent management and development practices increase the value an employee brings to the organization over time. These are great suggestions for minimizing the actual cost of employee turnover when it happens. To reduce employee turnover itself, Jack Altman suggests focusing on “growth, impact, and care”. He suggests having conversations with employees about goals, giving them more responsibility, and helping them acquire new skills to encourage growth, articulating a clear and purposeful company mission to clarify the impact each employee will have, and building a culture that shows care and appreciation. You may think optimization doesn’t have much to do with reducing employee turnover. However, particularly in an operations context, it can play a large role. Often, in an operations context, jobs can be especially demanding and competitive. Companies will compete with each other to retain employees, and often pilots and drivers will make decisions based on who offers more benefits. One of the main drivers we see for employee turnover is the quality-of-life experienced by operations personnel. Growing companies often experience some pains as they expand, and often those pains are felt most by pilots, drivers, and other operations personnel as they are forced to work longer hours. Some companies have started introducing policies like a guaranteed number of days off or nights at home per month. But implementing policies like this make things stressful on operations planners, leaving them to conclude that more hiring is needed to create schedules that work. Hiring more employees is sometimes the solution, but is also expensive. Where optimization can play a role is in maximizing resources under quality-of-life constraints. If increasing employee retention is your goal, and you use strategies like those outlined in this post to place an actual cost on the rate of employee turnover, you can actually solve scheduling and routing problems using this cost (employee turnover) as part of the overall cost optimization. Optimization like this allows you to directly account for employee turnover costs when planning to find the optimal solution. This also allows you to make concrete decisions on the financial implications of hiring more personnel, considering the overall cost at various hiring levels. Gaining control of your operations scheduling is critical to being able to assess whether hiring more personnel and offering other benefits will have a tangible benefit on your business. Once you’ve got a clear handle on the metrics surrounding these variables, you can begin to examine options for things like increasing days off, and make a decision based on the true cost to your business, rather than speculation. Optimization can also typically improve quality-of-life without requiring the need to hire more personnel, or identify issues in the current methods used for scheduling that could negatively impact certain groups within your operations. Overall, we hope we’ve shown you how important reducing the cost and amount of employee turnover experienced in your business is for the bottom line, and given you some tools to help assess the true cost in your business. We hope you find them useful - happy planning!